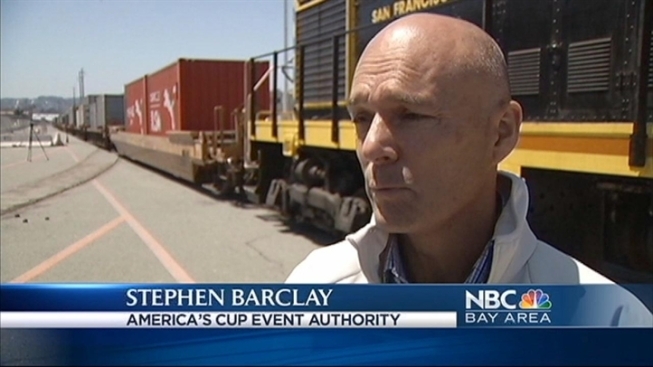 Before it can ride the tide, America's Cup boat have to ride the rails. When you hear mention of the America’s Cup Yacht race, the image of sailboats crisscrossing the Bay likely comes to mind. 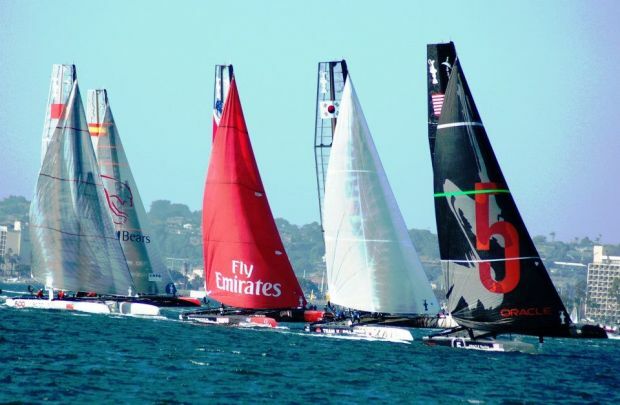 But an international fleet of 13 yachts showing up for the America’s Cup tune-up on the San Francisco Bay in August, made its grand entrance aboard railcars. A train pulling the first of 120 railcars loaded with high tech yachts and other equipment rolled into Pier 80, the home base of the Oracle Racing team, Tuesday afternoon. The supplies, which include high tech broadcast equipment used in the races, arrived by rail from Rhode Island, the site of last month’s A.C. World Series. Barclay said racing equipment is normally sent by ship, but rail seemed like a more efficient alternative. “By our calculations we saved 30 percent in our carbon emissions coming across,” said Barclay. San Francisco officials said it was the first time in a decade the city’s historic rail lines in the southeastern section had been used for such a massive load of cargo. The rails were heavily used decades ago when the Mission Bay area was a hub of industry. “In those days the city had cattle farms on the west side and the slaughter yards were on the east side,” said San Francisco Port Director Monique Moyer. In recent years, the city spent millions of dollars to upgrade the rails and the Illinois rail bridge to accommodate train cargo once again. “If San Francisco has an earthquake or something crazy happens and the bridges, heaven forbid go down, rail may be the only way in or out,” said Eric Smith of the San Francisco Bay Railroad. Longshoremen will begin unloading the containers this week and hauling the yachts and racing gear to Piers 30, 32. The piers will serve as the home base for a fleet of 13 international teams competing in the America’s Cup World Series from August 21st to26th on the San Francisco Bay. 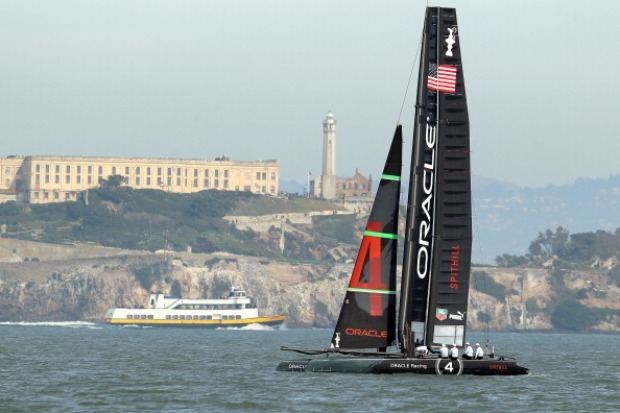 The race is a tune-up to the America’s Cup event in 2013. In the meantime, Barclay said spectators will be able to view the teams practicing on the bay for weeks leading up to the event. After months of heated negotiations between the city and the race authority, the rumble of train cars came as a welcome sound. Even if it was exactly smooth sailing.